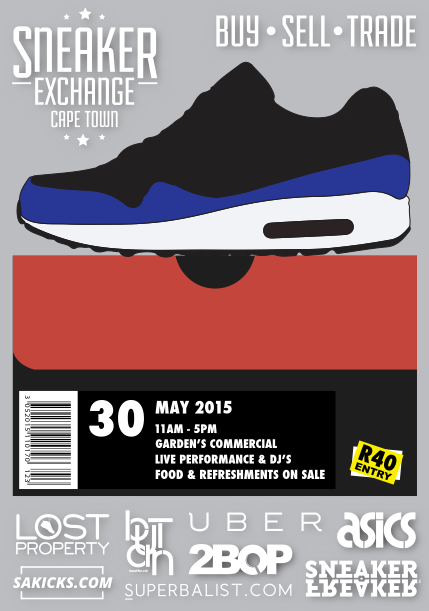 SneakerExchange in Cape Town this Saturday, 30 May. For those who don’t know, SneakerExchange is an event where you can buy, sell, or trade sneakers with fellow sneaker heads. The first and largest sneaker trading event in Africa. From its humble beginnings at a coffee shop in Woodstock Cape Town, the event has grown exponentially to individual cities throughout South Africa. With each event offering a different atmosphere, the original concept remains true to its root of BUY, TRADE, and SELLING sneakers. Furthermore, SneakerExchange is known to display many of SAs top influences in house and prioritizes on updating itself with worldwide trends as well as incorporating local element to the event. The first 20 people to enter SneakerExchange, will receive a complimentary goodie bag to the value of R750! SneakerExchange is open to all ages, and we’ll have activities to keep you entertained for the whole day – including live acts such as Twins on Deck! How to BUY SELL and TRADE? Buy: Purchase sneakers from vendors as well as people in the sneaker community. Sell: You are able to sell your authentic sneakers at the event, but you must keep them with you at all times. You are also able to purchase a vendor table in which you can sell your sneakers or clothing. Trade: You are able to trade authentic sneakers with people in the sneaker community at SneakerExchange.